Now that many of the competitions are over or nearing conclusion, the thoughts of the Team are turning towards making the very most of their experience in Scotland. This has included shopping (for a surprisingly wide range of eclectic items), spending nights in the hot spots of the City, and of doing a tour to Edinburgh. There was some apprehension amongst my fellow Volunteers about driving to Edinburgh on the Friday of the opening of the Festival Fringe, but my recent experiences of negotiating my way around the nether regions of Glasgow had filled me with enough confidence to give it a go. I’m fairly familiar with one route into Edinburgh, to the house of some friends, hard won knowledge from several roundabout trips over the years, but that is hardly a tourist hot spot, so it was a combination of following my nose, and allowing the onboard sat nav to make occasional suggestions, that led to a spot on the Royal Mile where I could stop long enough to let out my passengers. Their main objective was to visit a Scotch Whiskey museum while absorbing the general feel of the city, and thought that a couple of hours would be enough. I had tried to explain what the Festival would be like, and what would be happening in the streets, but I could see that they I hadn’t convinced them that they might need more time. In Glasgow, it is the people not wearing a Games lanyard around their necks who are the odd ones out. In Edinburgh, I was most definitely a curiosity. Even taking off my accreditation, I still stuck out like a sore thumb in my red and grey get up. It is a measure of how unremarkable I have grown to find this uniform that I simply out stared the people who paused to look at me while I was waiting in the line at the bank machine in Hanover Street. The Games marked car also attracted some attention when I parked it for a short while (the cost of parking there precludes anything but a brief respite), but I didn’t benefit from the indulgence and kindness of other drivers that I have experienced in Glasgow on the many occasions I’ve found myself in the wrong lane. Despite the fact that the Diving competition is being held in the City, Glasgow 2014 didn’t seem to have made much impression in Edinburgh. The street theatre my Team saw in the Royal Mile made a big impression on them. There is everything going on in the street, they said. 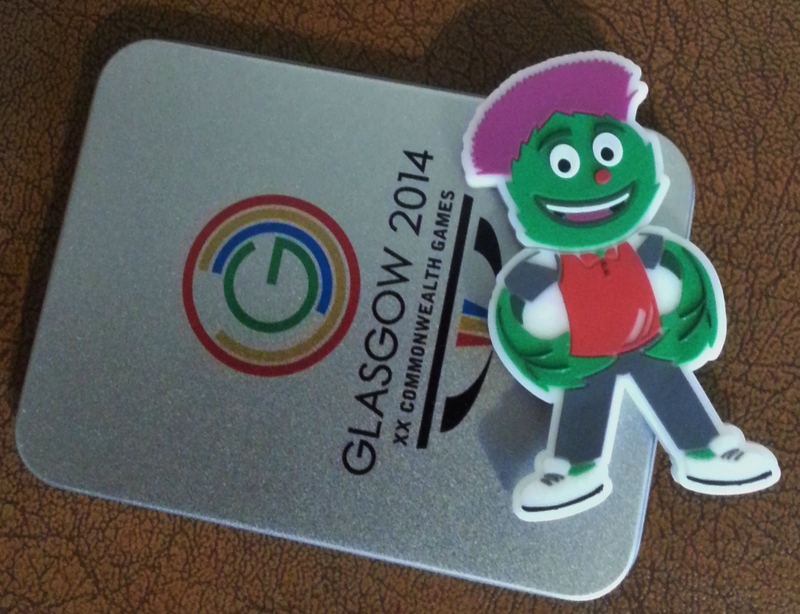 We didn’t have enough time…… but there’s not much here about the Commonwealth Games, is there? The big news of the day is Mozambique is on track to win another medal – in Women’s Boxing. Maria Machongua in the Women’s Light 57-60kg category is sure to get something; one more round will determine which colour. There are only three girls in the team here in Glasgow, and two of them will have won medals. I will forbear from making a politically feminist remark at this juncture. ……. Go Girls! There was a lot of excitement when the team got back in the car after the bout. But it was all go last night; no time for hanging about at the SECC, but straight off to Hampden Park for some athletics. It was my first trip there; I managed to get to the traffic jam around the stadium with no trouble, and if I had managed to work out where I was in relation to it (broadly is it to the East of me, or to the West) my passengers might have thought that I had navigated perfectly when we arrived at the right entrance entirely by chance and just at the moment I was about to start apologising for getting lost. You wouldn’t think it would be so hard to spot a sports venue of that size when you’re so close to it! I don’t think I had ever been to the East End of Glasgow until I attended the Volunteer Orientation event at the Emirates Arena earlier this year. I still don’t know very much about it, other than the immediate environs of Dalmarnock station, my commuting hub for the last couple of weeks. The Athletes’ Village is the centre of a massive regeneration area, including newly built houses, which will both social and private homes after the Games have finished. There is a mixture of terraced houses and low rise flats as well as a building that will be a care home for elderly and disabled people. The development, the size of some multiple of football pitches that I cannot recall (suffice to say it takes a good 20 minutes brisk walk from to get from one end to the other) will be finished off, with the installation of kitchens and the filling in of party walls which have been left open between pairs of terraced houses, once the athletes vacate the Village on August 6. I have only seen pictures of what was here before – elderly factories and Victorian tenement blocks. Some were very unhappy to see so much demolished and swept away, and there were protests and occupations in the run up to some phases of the demolition. And now the Village and the necessary transport hub bringing thousands of people in and out of it every day, are surrounded by a high security fence. But there are people living in houses just across the street. This is the view from the houses across the road from one of the vehicle entrances on the south side of the Village: athletes walking to and fro, cars dropping off and picking up, roaming TV crews trying to catch vox pop interviews on the hoof; security staff and armed police standing by. Most days when I have arrived for my shift, or on my multiple walks in and out, I have seen residents leaning on their garden gates, watching the world go by. There is one elderly lady who takes her morning coffee, and chats with passers-by while still in her dressing gown. The residents have endured all the noise and dirt of the demolition, of construction, and now are kept away from crossing their own road by security cordons and thousands of people in uniforms of various hues. Monday was a day of small victories. Firstly, I made my way from the Village to the Tollcross swimming pool, straight, no wrong turns, no doubling back, like a hot knife through butter, and then, from there, I made it straight to the SECC without any bumps in the road either. After the nightmares I endured last week in attempting to get to both of those places on the same day, it was a huge relief to know that I am still capable of learning from my mistakes! It took such an effort not to express my relief to my passengers on arrival at both venues; but it was a private victory, so I just drove to the drop off point and let them out of the car, pretending that this was a perfectly every day sort of happening. 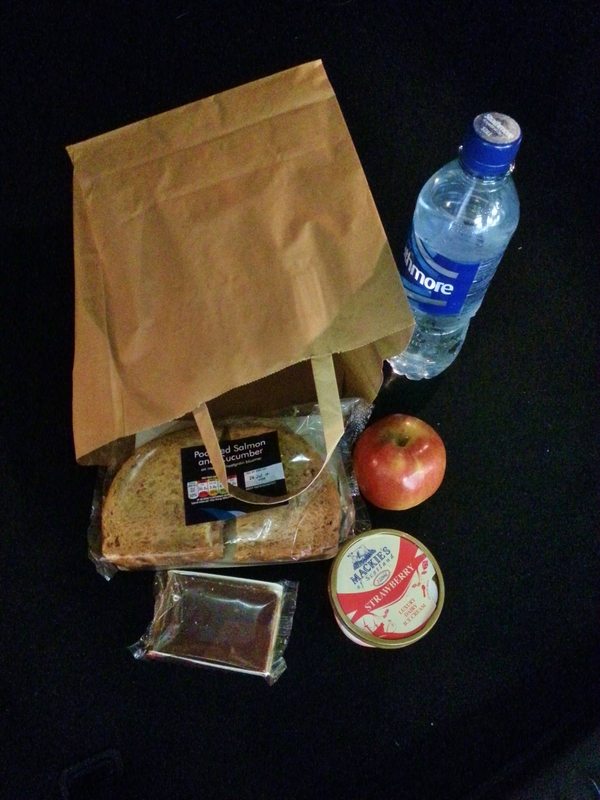 My second victory was to secure lunch at the SECC. As my base is at the Athletes Village, that is also the place where I can have a meal as a matter of course by simply picking up a voucher from our dedicated check-in desk . Those of you who have been following my Games adventure will know that I have rarely been at the Village at meal times, and have, on some days endured an enforced period of fasting. As a ‘roaming CGA assistant’ I should be able to get a meal at any venue, but first I have to get a meal ticket there, as for some mysterious reason, the tickets from one place cannot be used at another, and the ticket regime is an absolute. I had an hour or so between drop off and pick up at the SECC so I made food my one mission. The car was in the car park that everyone calls the Cheese Grater at one end of the SECC site, and the Workforce check-in is in a downstairs area of the Crowne Plaza hotel at the other end. It was the sort of ‘go up there, left there, then right and down the stairs at the bottom and then through there and it’s round the corner at the end’ journey, but I was determined not to be defeated. Having secured the voucher, it was then back, halfway to where I had started, to the Workforce Dining to collect a brown bag, a sandwich and a tub of ice cream. By the time I got back to the car, the whole process had taken me half an hour. In celebration, I sat on the tail gate of the car and ate. 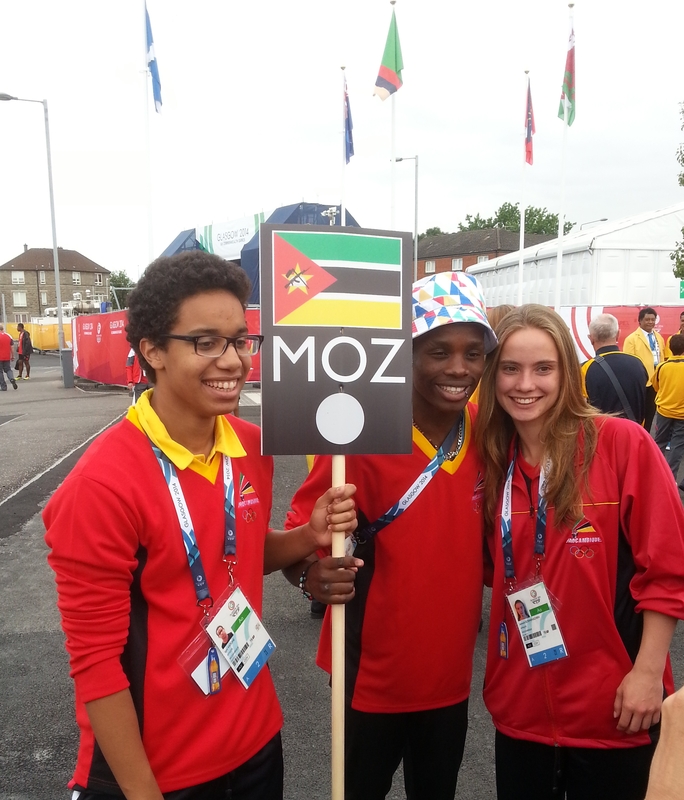 And finally the biggest victory of the day – the Mozambique team won a medal! Silver for Maria Muchavo in the women’s T12 100m. I caught the final on television, and for the first time of this Games found myself rooting for a competitor, and actually punched the air when she came across the line in second place. The BBC coverage was entirely biased towards the English runner Libby Clegg, so one might have thought she was the only one in the race, or receiving a medal, but occasionally on the edge of the shot I could see ‘our girl’. Just before entering Celtic Park for the Opening Ceremony. 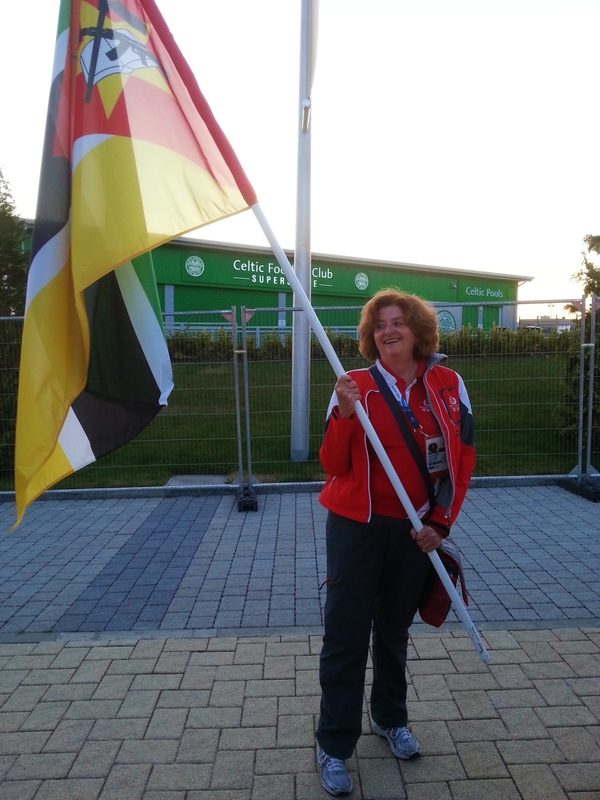 I’ve been working as a Volunteer Assistant affiliated with the Mozambique team at the Commonwealth Games for just over a week now, and I’ve learnt a few things both about the huge operation behind the Games, and about myself. There are thousands of people involved in the Games, both in front of and behind the scenes. And few, if any of them, have the whole picture of what’s going on. I’ve had some real struggles, some self inflicted, others less so, in finding some of the places to which I’ve been trying to drive my team members. I’ve spoken to scores of people manning barriers and road blocks along the way: policemen from other cities in Scotland who have less idea of the geography of Glasgow than I have, and security staff who have no clue which venue they are near. When I’ve found myself at the right entrance they couldn’t be more helpful in pointing me in the direction of the final little bit of the route; but I’ve also had the experience of being just around the corner and uncertain, and been told that I’m in completely the wrong place. Because of the security in place all around the city, and especially around the venues lots of roads are blocked. Some are completely blocked to all traffic, and some are blocked to all but authorised vehicles. I’ve been driving on such vehicle, but I have found it quite tricky sometimes to tell the difference between the two types of barriers! I’ve discovered that I’ve had to bear a tremendous amount of embarrassment, and feelings of incompetence and stupidity, and still keep my cool and sense of direction. I have seen no sport at all. I don’t even have any sense that there are crowds of spectators in the venues. I’ve been driving to the Games Family VIP entrances and waiting in the specially reserved car parks. The biggest crowds are of the other Volunteer Drivers having a chat while they too are waiting. From inside this bubble, it feels for all the world as if Glasgow has thrown this big party, but apart from the people inside the village, and the ever circulating fleet of Commonwealth Games cars, no-one has come. I have seen snippets of the extensive TV coverage of the event, and realise that I have no sense of engagement with any of the teams, other than Mozambique. Should I be supporting England or Scotland? I don’t feel anything like the affiliation I did for Team GB at the Olympics. The separation into all the various Territories of the British Isles seems like so much unnecessary Balkanisation and a little bit of a turn-off. A couple of my friends have tried the so-called 5:2 diet, which involves fasting for 2 days in 7. It’s not something that has ever appealed to me, and now, after a couple of days of missing meals because of driving commitments, I know it wouldn’t suit me. Going without lunch and dinner makes me feel bad tempered and not very well. It’s a relief to know I can cross that off this list of eating plan options. In the meantime, I have to thank the staff in the Café Nero in Union Street who let me run in and use their toilet, even though the shop was closed, when I got caught out waiting for some of my team in the City Centre. The self consciousness I felt on the first day I wore my Clydesider uniform has long since gone; there are so many other people wandering around the city in exactly the same get up, it’s barely worth noticing any more. In fact it’s the people without a lanyard and accreditation around their necks who look strange to my eye at the moment. Having said that, in the uniform I’ve had more conversations with strangers, mainly on the train, than I’ve ever had before. People do seem genuinely interested in what is happening, and in seeing so many visitors from around the world all over the city. And I’ve quite a good story to tell – some people might have received more information than they had bargained for when they ask me what I’ve been doing all day, or where I’m going. On Thursday the man in front of me in the queue to buy a ticket at Helensburgh station asked me a question about the revised Games timetable, and that turned into a long conversation about our respective roles (he was off to be in the radio control centre at the Velodrome), and thence to a realisation that he had known my father when they were both involved with Dumbarton District Council over 12 years ago. It’s already become one of the clichés of the Games that Glasgow is the friendly city; but the Chef de Mission of my team has echoed the comment. ‘Much friendlier than London’ she said, after the driver of the car stopped beside us as traffic lights tooted. I opened my window, and he and his children shouted out ‘Good Luck’ to her. 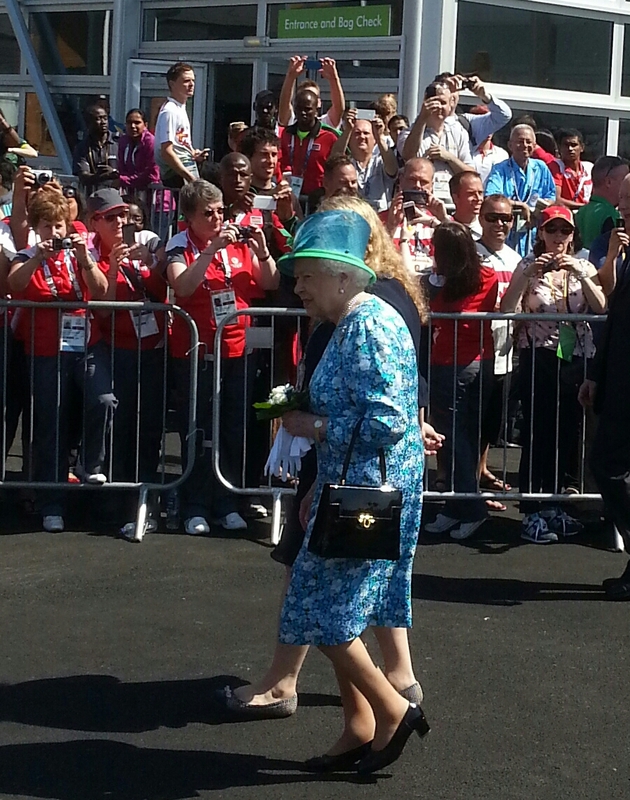 I was on my way into the Village on Thursday to sign in for my shift, when my way was barred by a crowd, susserating with the prospect of The Queen emerging from the Athletes’ dining hall. I waited a few minutes, and there she was, looking bright and cool and smiley, even though the day was roasting. She had apparently been there for some time, meeting lots of people, and shaking hundreds of hands. Today will bring more surprises and lots of the unexpected, I’m sure. Did you see it? I was there. I was there, but outside Celtic Park; close enough to hear the roars of the crowd, but too close to be able to see any of the big screens. But I felt part of it, a small part of the massive logistical operation that got more than 4000 people to walk out of the confines of the Athletes Village up to Celtic Park, in the right order, on time and without any major dramas. There were volunteers acting as traffic wardens, stopping some teams, waving others on faster, and making sure we all slotted into place in the right order. and trotting in step, and the Cook Islanders, flowers in their hair, serenaded us in close harmony. 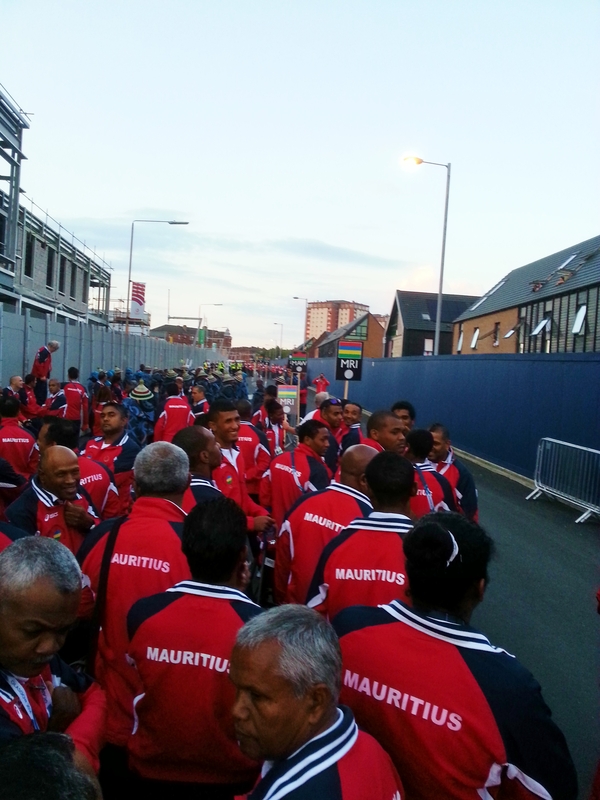 Mauritius slotted in, in front, and Namibia behind and it was as cosy as the biggest busiest queue you have ever been in, but significantly more cheerful. People from the houses in the adjacent street were out to watch and the cheer the arrival if each team, and hundreds and hundreds of photos were taken by everyone there – of each other, of the other teams, of the people watching. Encumbered by my lollipop flag, it was a bit tricky for me to take photos, but that didn’t stop me trying. We were starting to get a little fretful with all the waiting, when suddenly, from nowhere the REd Arrows roared overhead leaving a trail of red white and blue in their wake. Somehting was definitely about to happen. Slowly, we started to move forward, before turning behind the Emirates Arena and across the road up the ramp to Celtic Park. I handed in the lollipop, and Kurt, the Mozambique flag bearer was given the flag to carry. And more photographs, despite the fading light. If I had felt proud to carry their flag at the rehearsal, I can only imagine how he was feeling. He said he wanted to try to emulate Chris Hoy carrying the GB flag at the Olympics with one hand, but after trying it for a few minutes, decided that it was indeed an ‘epic’ feat, and not one that he could copy. And if they were excited by receiving the flag, that was nothing compared to the moment they met the Scottie Dog. When I met the owner at the rehearsal on Monday, she told me that the dog was loving the experience – they were doing both Mozambique and Cyprus – and he did appear very happy to be petted and photographed by all the team, even standing sideways for them to get the full coat with the country name in the shots. I walked with them to the door of the stadium, and then told them to enjoy it, and they disappeared into the bright lights and roaring crowd beyond. I then walked to the exit door, where we had been asked to stand to point the way back to the Village for those athletes who wanted to participate in the parade but who did not want to stay out late for the show. I stayed to hear the greeting the Scotland team received, and then walked back down to office in the Village, carrying a few of the lollipop flags over my shoulder, silently singing ‘Hi ho, hi ho’ all the way back. A friend has recorded the television coverage of the Ceremony, so I shall be reliving it in a couple of weeks, but it was a rare experience to have been mingling with such a crowd of people, if only for one evening. 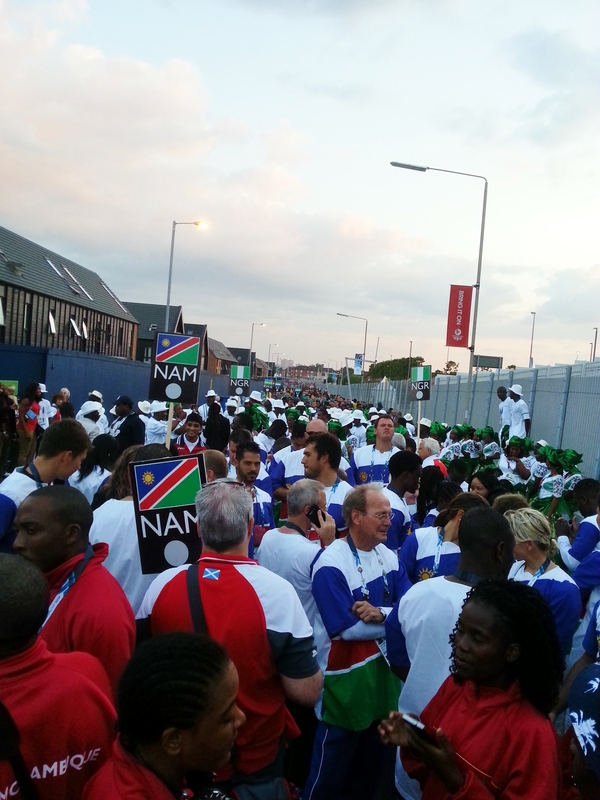 Every country team participates in a Welcome Ceremony in the Athletes Village, and Mozambique had theirs yesterday. They shared it with Cyprus, Malaysia and Niue, so neatly representing four of the regions of the Commonwealth. Gathering the team was easier than I thought – I am now the expert in standing with the Mozambique flag ‘lollipop’, and everyone came to me. Inevitably, in the time spent waiting, there were myriad photo opportunities, both official and more casual, and of course the lollipop was a popular addition to many group shots. The teams were welcomed by a cast from the National Youth Theatre performing a short musical about the fun and anticipation of going to a festival; such energy and talent. And they appeared to be able to erect a tent with only one hand and a flick of the wrist! There was then a speech from the Village Chieftain and a representative of each team was invited up to exchange a gift with a person from the region in Scotland with which it had been twinned. The flag of the country was raised and the national anthem played. There was extra poignancy and emotion for the Malaysian part of the ceremony which included a moments silence, and their flag was raised to only half mast to acknowledge the terrible tragedy which befell one of the their airliners. Then there was more singing and dancing from the Youth Theatre before they led us all back into the residential area of the Village for more photographs and smiling. 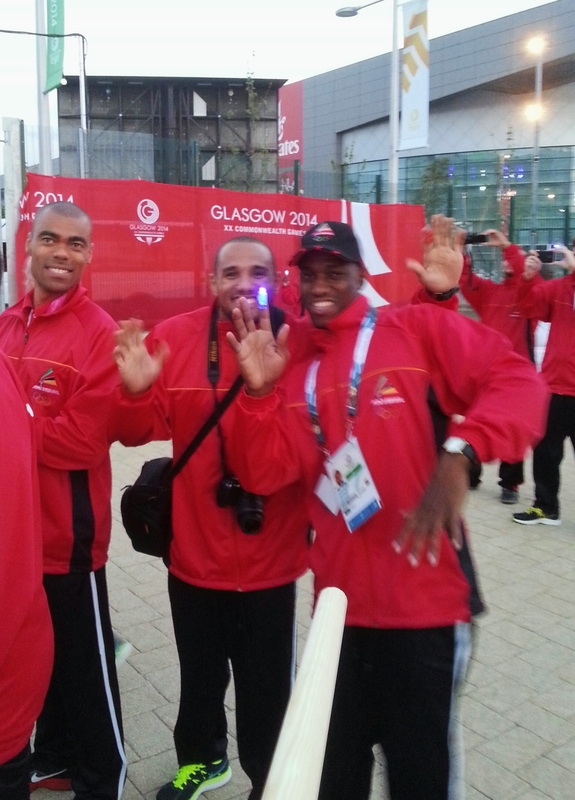 It was my first opportunity to meet any of the Mozambique athletes, which was a treat. They are all so young and thrilled to be at an international competition, and focussed on achieving a personal best while they are here. They all wanted to know what the Opening Ceremony will be like, but I was true to my promise and didn’t spoil any of the surprises; even if the swimmers won’t actually be able to participate as they have competitions from early Thursday morning, and so have to go to bed early. I hope you’re able to watch the Ceremony tonight – spare a moment’s thought for me standing outside Celtic Park, tantalisingly close, able to hear the noise, but not close enough to see the show, and give a little cheer for my team when they parade. 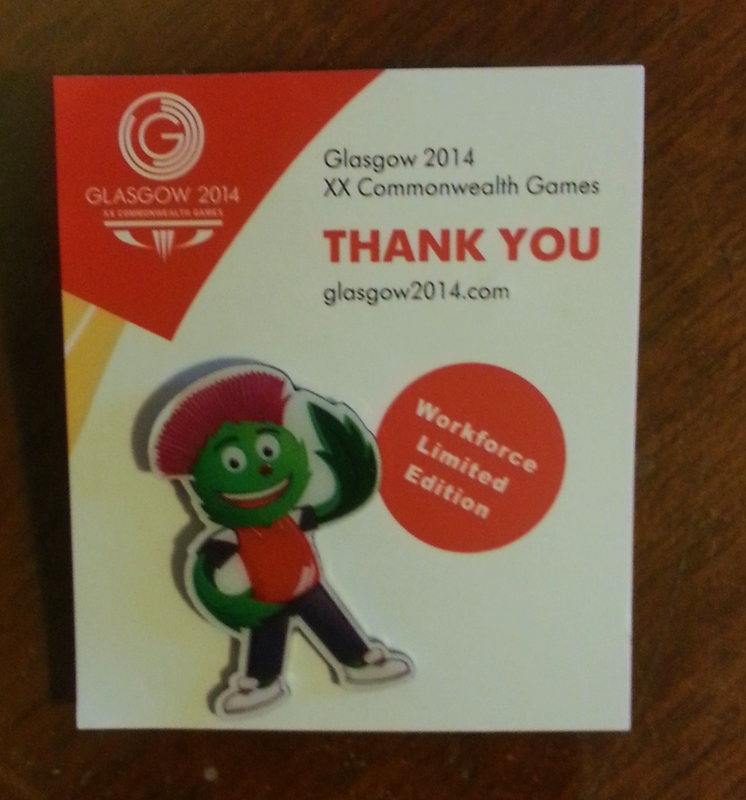 I took part in the second of the rehearsals for the Opening Ceremony for the Glasgow 2014 Commonwealth Games last night. I won’t spill any of the surprises, but I can say that it was an astonishing experience, and one I am unlikely to have again. My role was to stand in for my team, Mozambique, as I will be showing them where to go on their way to the Real Thing on Wednesday. I had to follow a specified route around and out of the village, walking ‘like an athlete’, which is something of a slow roll, and then wait in the right place in the procession for entry into the stadium. And then, flag in hand, I did the walk around ‘the field of play’ inside Celtic Park. They announced the country, the crowd cheered and my face appeared on the big screen. Bathed in the stadium lights I managed to keep the flag flying properly, no wrapping itself around the pole. And just as I felt that I was really getting into the swing of it, a guy came and took the flag away and it was time for me to sit down. Even though Mozambique is only my country for the duration of the Games, and it was only a rehearsal, it made me curiously proud to carry the flag for them. It’s a cliché to say it, but that’s because it’s true, but there were a massive number of people all giving it a great deal of enthusiasm and energy, contributing to the event. I may not see much of the Ceremony of Wednesday as it happens, as I will be waiting outside Celtic Park, but now, after that experience, I have some understanding of how much fun it will be for the athletes and all the other people who were dancing their arms off last night.